Want a price on the St,. 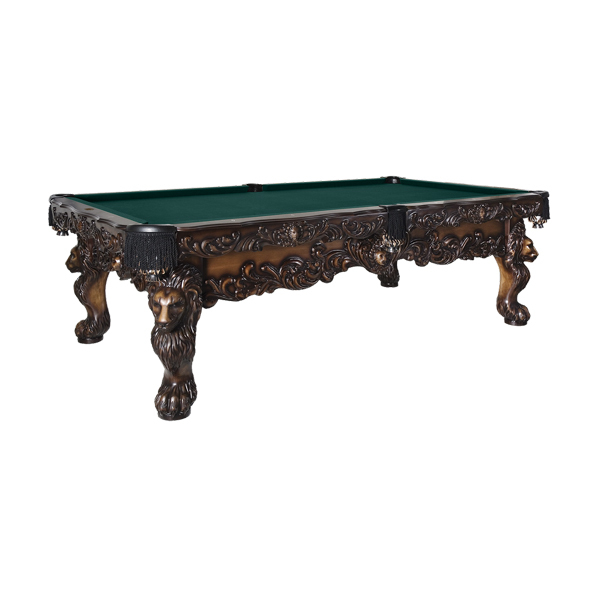 Leone Pool Table by Olhausen? Call Us to Speak to a Sales Representative ! 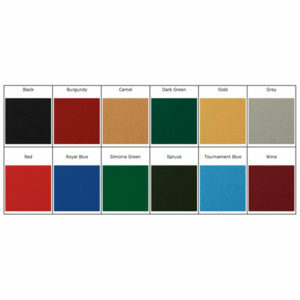 We offer cue storage drawers, ball returns, custom inlayed rail sites and more. 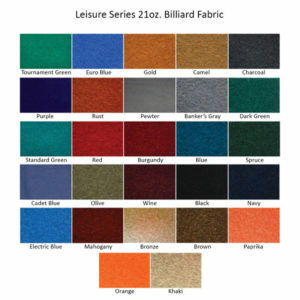 (Olhausen®) warrants its billiard (St. Leone Pool Table by Olhausen), pocket billiard (pool) and snooker tables (Products) against defects in material or workmanship (excluding normal wear and tear). Olhausen, in its sole discretion, will either repair or replace any and all parts proven to be defective. Excluded are any Products sold or used for commercial purposes. This Lifetime Warranty is subject only to the limitations as set forth below. This Lifetime Warranty is non-transferable and only applies to the initial purchaser of the Product (Owner) from Olhausen or an Olhausen Authorized Dealer or Agent. Cloth, pockets, and non-Accu-Fast® cushions are not covered by this Lifetime Warranty. This Lifetime Warranty is void if the Product is not installed and serviced by Olhausen or its Authorized Dealer or Agent. Parts returned here under shall be shipped by conventional surface freight to Olhausen pre-paid. If the parts are determined by Olhausen, in its sole discretion, to be defective, they will be repaired or replaced and returned pre-paid by conventional surface freight carrier. The cost of shipping (as provided herein) the Product to Olhausen shall be reimbursed as well. The labor cost for removing or replacing the damaged part shall be paid by Olhausen or its Authorized Dealer or Agent, however if the claim occurs more than one year from the date of original purchase, shipping costs shall be the responsibility of the Owner. Repair or replacement of any defective parts shall constitute complete fulfillment of all obligations with respect to the Product. This Lifetime Warranty does not require the replacement of the entire billiard, pocket billiard or snooker table. 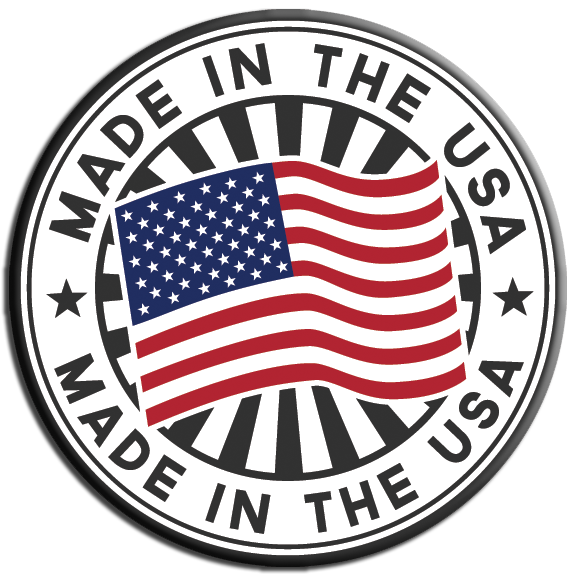 Olhausen’s exclusive “Made in the U.S.A.” Accu-Fast cushions are included in most but not all of the Products. This Lifetime Warranty includes Accu-Fast cushions. Olhausen shall pay for all shipping costs incurred with respect to any Accu-Fast cushion claim approved as provided for herein. THIS WARRANTY IS IN LIEU OF ALL OTHER WARRANTIES, EXPRESS OR IMPLIED, INCLUDING THE IMPLIED WARRANTY OF MERCHANTABILITY OR FITNESS OR USAGE FOR A PARTICULAR PURPOSE. Olhausen neither assumes nor authorizes any persons to assume for Olhausen any other obligation or liability in connection with the Products. This Lifetime Warranty does not apply to damage resulting from accident, alteration, misuse, abuse, flood, fire, earthquake or any other natural calamity. I founded this company with my brother. I build our pool tables. I stand behind them. 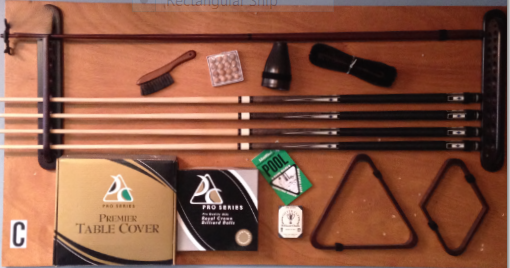 1 Set Of Pro Series Billiard Balls(w/Lifetime Warrenty), 1 Wood Triangle, 1 Wood Diamond, 4 Two Piece Energy House Cues, 1 Seven Place Wall Rack, 1 Bridge Cue, 1 Deluxe Vynil Fitted Pool Table Cover, 1 Dozen chalk, 1 Rule Book, 1 Under Rail Brush, 1 Nine Inch Brush, 1 Leather Pill Jug, 1 Set Faux Wood Pills. 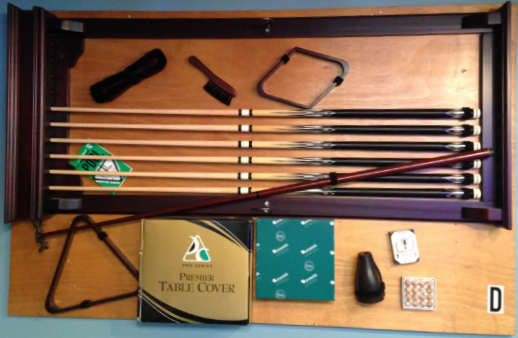 1 Set Of Aramith Premier Belgium Billiard Balls, 1 Wood Triangle, 1 Wood Diamond, 6 Two Piece Energy House Cues, 1 Framed Wall Rack With Crown, 1 Bridge Cue, 1 Deluxe Vinyl Fitted Pool Table Cover, 1 Dozen chalk, 1 Rule Book, 1 Under Rail Brush, 1 Nine Inch Brush, 1 Leather Pill Jug, 1 Set Faux Wood Pills. 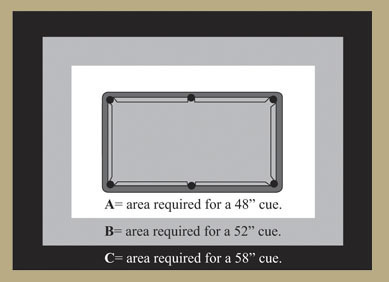 Use this chart to determine the room size needed for a particular table and cue combination.